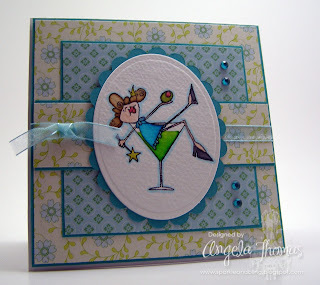 Welcome to the Birthday Blog Skip, Hop & Dance sponsored by Stamping Bella! If you've just happened upon my blog, you can CLICK HERE to start from the beginning at Bloggabella. To start off, I want to wish Emily a very happy birthday!!! If you only knew how much of my paycheques you end up receiving. Stamping Bella stamps were the first non-SU stamps I bought and man - I've been hooked from early on!!! I love how much fun they are. OH MY GOODNESS!!! How much fun is this? I hope you've been enjoying the wonderful creations you've seen so far! Now what birthday isn't complete without an appletini??? I believe there is a rule that a martini must be had on someone's birthday! Or at least it's a rule on my birthday. I think Stella has had one too many already and to think of how early it is today! But it's 5:00 somewhere right? Hehehe.... I'm bad - I know! I've stamped "Stella with an olive on top": with Versafine Onyx Black on Watercolor paper and then colored with my Tombows. I haven't graduated to Copics or Lyras yet but the Bella Babes sure make me want to. The colors came together quite quickly once I picked my Scenic Route DP. Can I just say how much I heart the new In Color - Bermuda Bay??? LOVING IT!!!! It makes this card pop. Have a great day!How about a prize? In addition to the fabulous eye candy, we have decided to hide a prize somewhere along the hop! One pre-selected blogger will draw a random winner from the comments on her post, and the winner will receive a $40 Gift Voucher to Stamping Bella!!! The fun part is...we're not telling you who it is! So as you hop, make sure you leave comments on every post so you have a chance to win!! We will announce the winner on Monday in the Splitcoast forum. MWAH! stunning! I love Stella with an Olive... she is just perfect. The colors you used are just perfect! Love it - Stella is so much fun! Isn't Stella a kick...love her and this darling card! I love this image. Great card!!! I love what you have done here! The stamp, the color, the paper, brilliant job! I love everything about this! Awesome!!! wow Love your card the papers are gorjuss!! Super cute!! I love the colors and sketch! Aaah! I love this Stella! Wonderful layout too!! This is perfectly put together! Love it all! FUN! Gotta love the Stella! Beautiful card. This is just to cute, love your card and color choices. Hahahha! This is awesome! She reminds me of my mum when she's had one glass too many! LOL I'm so enjoying seeing all the different stamps everyone has used. I think Stella is feeling a bit tooooooo good!!! She'll never remember the hopping!!! Too cute! Love the colors and DP. Stella always makes me laugh! Bottoms up, Stella! What a fun card! Love your paper choice. Beautiful card. Love, love, love your card. You go Stella!!! Such a fun card! Love that paper! TFS! What a fun Birthday card. It's perfect for Emily! Now that image would be me on my birthday lol! what a wonderful creation.. so pretty! Ahhh, everyone needs a martini on their birthday!! Fantastic card and love the paper and design. So pretty! Stella's got the right idea! Great card! Stella is so much fun! She is already having a party on her own! Love the colors!!! What a great card for a birthday!! Cute card! Everyone's done such a great job! Definetly a stamp going on my wish list. Great job. That blue and green is so pretty and your stella is so much fun! Cute card! I so love the Stellas! Beautiful card! oooh! I ove th ecolor combo! Stella looks divine sitting in her appletini! Beautiful card! Fun card! The image definately makes me smile! Such a fun card. Love the colors and the image you chose for this! :) Great job on your card. So pretty! Love your colouring! The layout and color combo is wonderful. loving the bloghop, and hope Em's birthday ROCKS! Your card is fabulous and I just love Stella! Super cute! Very cute! I could use one of those right about now! Cute, cute card!! Course you can't go wrong with Stella. Love her!! Gorgeous card!! Love the colors!! That stamp is just too cute!!! Gorgeous card!! Love the layout and DP!! I'm also participating in the blog hop. stella is darling in those colours!! What a fun card, really cute. I love this! It makes me want to buy that stamp right now!! Gee thanks... another stamp I just have to have!! It is always 5 o'clock somewhere! Love your card. Love your Stella card - and great colour combo!! This Stella always makes me smile. You are so right about the appletini. Great Card. What an absolutely fantastic and funny card! Love the colors. Too cute. I hope Em is having that much fun tonight. lol. wow -- how did I miss this stamp??? LOVE IT and your card! Love the colors you used. This image cracks me up! Great card! Happy, happy birthday to EmmyBella! Your partying Stella lookes like she knows how to have a good time! Thanks for sharing! I luv this card! your coloring is so amazing!! TFS! Totally cute card!! I haven't gotten a chance yet to play with Bermuda Bay, but it looks pretty in the package :) Bellas were some of my first non-SU stamps too, love 'em! Ang, you used one of my FAVORITE Stella's and you did it exceptionally! I love this card and I love how you colored Stella so brightly! Looks like the perfect way to celebrate a birthday! 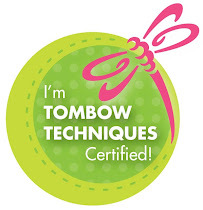 Love the bright colors and what a fun stamp!! What cute Stella! Great job. Gotta get me a Stella stamp set!! Very fun birthday card! Oh your card is just so Funtabulous!!! Love the color combo!! So bright and funky!!! BTW, I LOVE your blog design!!! stella with an olive on top has to be my most favoritest stamp evah!!! cute card! don't you love that image. great job on the card. Sooo cute! This is my favorite Stella too! Stella is such a party animal! Cute! I love everything about your card!